When did you buy your first smartphone? Were you in line with me on the first day of iPhone availability, or did you wait until the platforms multiplied and matured? Where are you on the early adopter curve? Do you relish the bleeding edge, or do you prefer to let someone cut a trail for you? I ask this because we’re at a similar juncture in motorcycling. 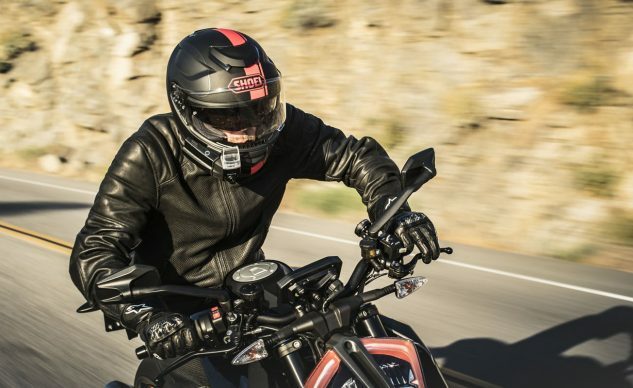 The NUVIZ head-up display (HUD), the first HUD built specifically for motorcycling, is hitting the market, and the way we gather information while riding a motorcycle is about to change. Are you ready to jump in? For those who are unfamiliar with HUDs, they are a means of delivering information via a translucent display which allows the rider/driver/pilot to view information without looking away from the road. The technology has been used for decades in fighter jets and more recently in cars in which the data is projected onto the windshield. The challenge for motorcycling has been the location of the rider’s eyes inside of a helmet and not behind a fixed windshield. There’s no ignoring the NUVIZ’s size, but it packs a ton of technology. Although the translucent prism looks like it could interfere with the rider’s line of sight, it fits nicely just below the rider’s primary field of vision. 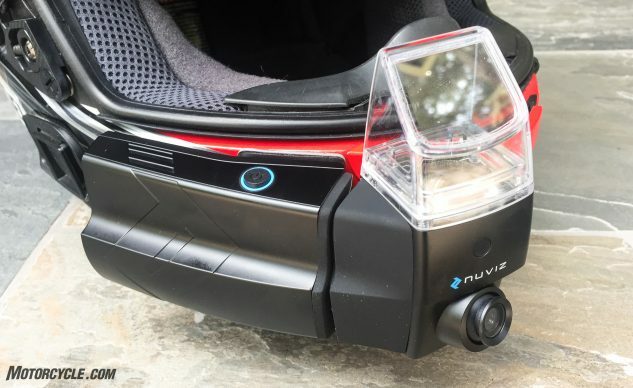 The NUVIZ unit attaches to the chin bar of a rider’s helmet, placing the translucent optical prism housing slightly below the rider’s right eye. The location of the prism is below the main field of vision, keeping it from blocking the rider’s primary view, but enabling the rider, with only a slight tilt of the eye, to view a virtual screen which appears to float 13 feet ahead. Compared to the traditional location of instruments on the motorcycle dash or handlebar, the amount of eye movement and refocusing required to view the screen is minimal – and this is the real benefit of a HUD. Before delving into the advanced information features, let’s just consider the act of checking the speedometer, where the NUVIZ HUD takes the rider’s eye off the road for a significantly shorter time and requires no movement of the head. The 800 x 480 pixel viewer currently delivers information via five different screens which are controlled by a little remote mounted to the left handlebar. All of the screens show the time in the top right corner and the NUVIZ battery status in the bottom right. The screen you’ll probably use the most is the Speedometer which shows the current speed in large numbers in the center of the screen. Above the speed, the speed limit is shown. If you’re exceeding it, a red circle surrounds the speed limit, giving an instant visual which can also be augmented by a warning sound set to a user-preferred amount over the posted limit – a boon when you’re on unfamiliar roads. 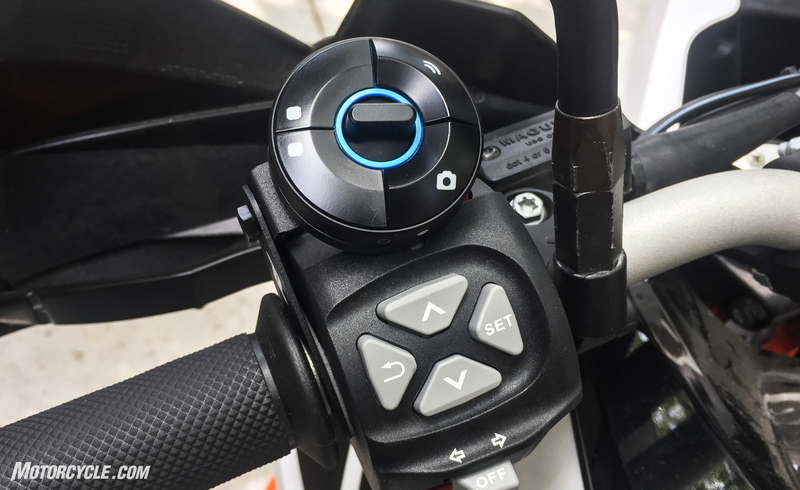 The NUVIZ remote (top) can be mounted on multiple bikes via the included hardware. The buttons on the left correspond with the icons on the left side of the screen. The central toggle switches between screens with short flicks, while long presses control the speakers’ volume. A quick flick down on the remote’s toggle switches to the Maps screen where you’ll be given the same speed information at the top of the screen. If you’re following directions, you’ll also see which way your next turn will be and how far. At the bottom of the screen, the distance remaining and time remaining are shown. The central map’s level of zoom can be set to the rider’s preferences by the remote. The next flick down on the remote brings up the Rides screen where the rider’s saved routes can be shown – along with gas stations. Choosing a route is a simple click or two away, and once selected will be shown on the map. When entering new routes or the address of a destination, the NUVIZ smartphone app provides an interface that is much more flexible than the screen on the HUD. The app also allows riders to access photos captured by the included camera while riding, and view ride statistics. Future capabilities can be added to NUVIZ through a software update function within the app. 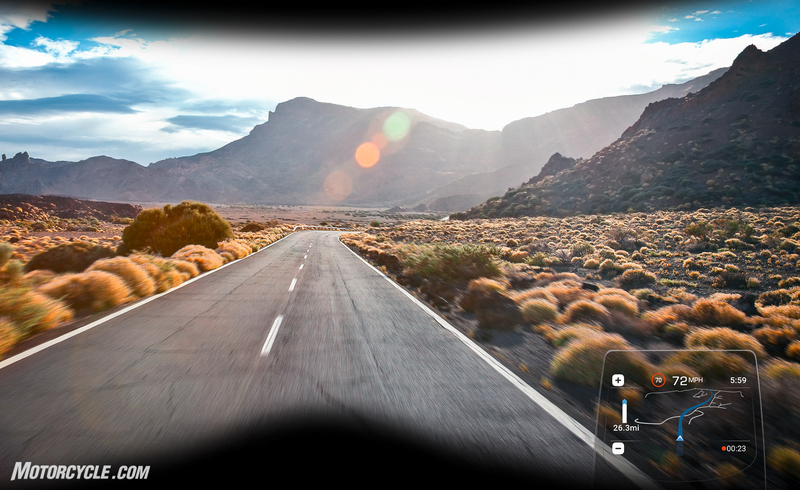 This POV rendering shows how the NUVIZ screen is unobtrusive until the rider glances at it. This map screen delivers the motorcycle’s speed, the speed limit, how many miles until the next turn, the current time, and the fact that video has been recording for 23 seconds – all without visual clutter. The Music and Phone screens are accessed with the same toggle, and they show song/artist information and caller/number data. Both of these fields can be delved into deeper through button clicks to select songs or address book entries, but we recommend pulling over first. Those aren’t all of the NUVIZ’s features, though. A camera capable of 8 megapixel stills and 1080p 30fps video resides on the bottom of the optical housing. The camera itself is ball-mounted, allowing for it to be adjusted to give the correct view for how the unit itself is mounted to the rider’s helmet. As with the other functions, the camera is controlled via a dedicated button on the control unit, with a short press taking a photo and a long press starting/stopping video recording. 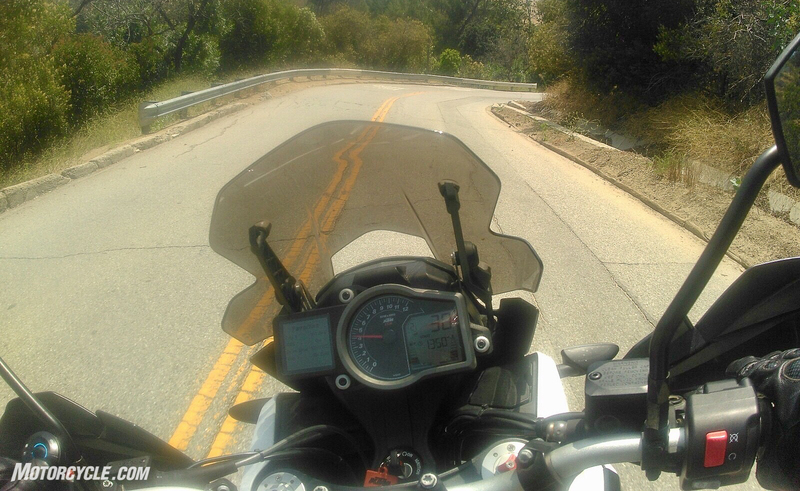 Here is an example of a photo captured on a ride with NUVIZ. Click on the image to see it in a higher resolution. Look under the MO logo to see the thumb triggering the camera. Using the NUVIZ only took a couple hours to become familiar with the controls. As with all GPS devices, it takes a little while to accustom the eye to reading the visual language that the manufacturer has created, but I quickly adapted to the NUVIZ. After previously using only voice prompts for navigation when riding, having a map within an easy glance is quite helpful when getting from one location to the next in an urban setting. Although I did wish that the voice prompts included the street name, it is available at the bottom of the map screen. On longer rides, the listing of mileage to the next turn helps to pass the time. Since I spend tons of time on short hop errands where I know where I’m going, the speedometer screen is my most commonly used view, and I’ve quickly grown to depend on it. Additionally, having the name/number of incoming calls appear before my eye makes it easy to decide if I need to take it or can wait until I get home. Up until this point, I’ve avoided the elephant on the chin bar because I wanted to address what are the strong points of this new technology, but now we need to consider the NUVIZ’s size. For some people, the 5.8-in. x 2.3-in. main body (3.9 in. tall on the optical housing) will be a deal killer. Yes, the unit is large. However, at speed, the wind resistance isn’t any more pronounced than mounting a GoPro off the side of a helmet. I’ve noticed a little more wind noise at highway speeds, but since I wear ear plugs on the open road, this isn’t a problem. Around town, I don’t experience any difference in how my helmet feels. For those who worry about the effects of crashing with the NUVIZ, it is designed to tear away on impact, thanks to very shallow mounting screws. With the purchase of accessory mounting kits, owners can mount their NUVIZ to all of their helmets. As an admittedly tech-focused user, I’m heaping a bunch of praise on the NUVIZ, but it’s not without flaws. The boot-up process takes a while and requires input from the remote to begin regular function. My workaround for the lengthy startup time is to quickly press the power button to turn off the screen and save battery when I’m only going to be off the bike for a bit, like when going into a store. Once I’m ready to ride again, the screen pops to life immediately when I press the button. This photo gives a good representation of how the NUVIZ prism is under the rider’s primary view but easily seen with just a small shift of the eyes. My biggest complaint about the NUVIZ has nothing to do with the HUD. 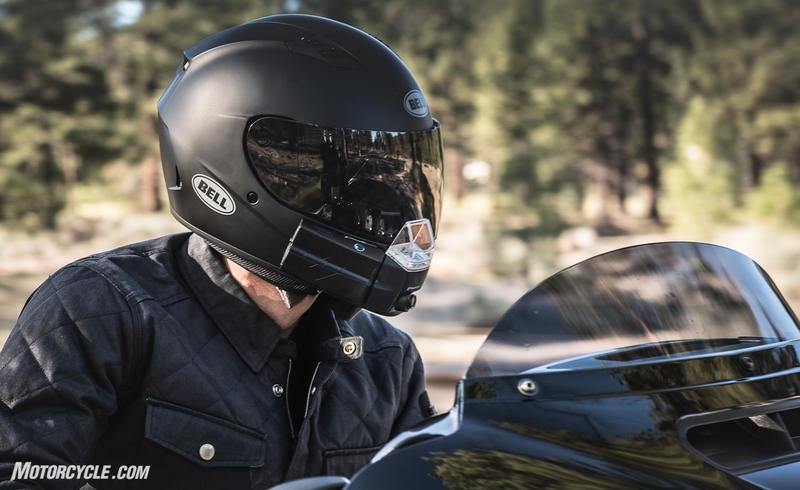 Unfortunately, the sound level from the helmet speakers is too low to be easily heard at highway speed – particularly if you are wearing earplugs, as all riders should at those speeds. Around town the level works fine, but I have trouble hearing the directions above 65 mph. Usually, I can hear that directions are being given, so I simply glance at the screen to get the information. However, with all the focus on the device’s technology, this is a surprising oversight. Perhaps replacing the speakers/microphone with a third party set would solve the problem. For best audio performance, mount the speakers so that they are lightly touching your ear just over the canal. 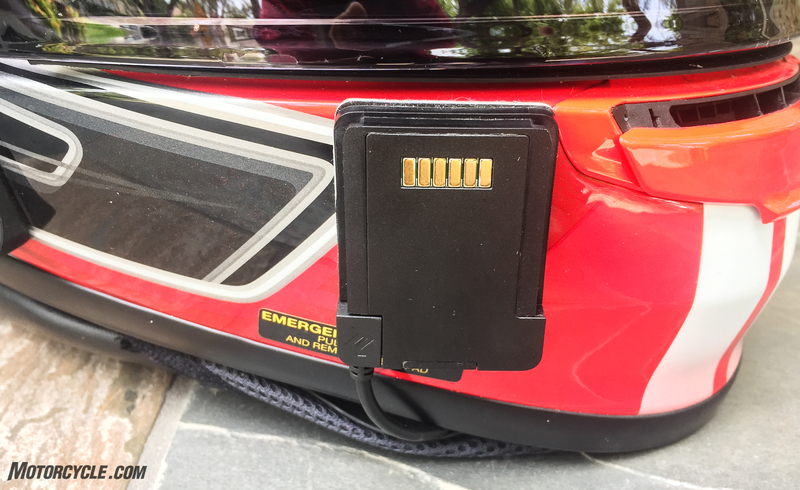 NUVIZ is off to an impressive start with this first-generation implementation of HUD technology for motorcyclists. The visual display of information is top notch – particularly with the auto-dimming feature for varying light conditions. The functionality is clearly based on the essentials. Bells and whistles, like the communicator function, can be added via software update in the future. The video function is good for riders who like to record dash cam footage of their commutes or hero videos of their canyon exploits. The still camera produces crisp, well-exposed photos. Both the stills and the video display the quality one would expect from a sensor that small, making them comparable to many smartphone cameras. The music and phone functions appear to be well thought out, though the microphone’s noise canceling is merely average compared to the quality of systems like the Sena 20S. Still, the heart of the NUVIZ is its display and how well it delivers the information a rider needs with the smallest change of eye position. The price for NUVIZ is a hefty $699. To me, that’s not surprising. Most tech fans are used to paying the early adopter tax frequently required of first-generation devices. In the future, I’m sure that the price – as well as the unit’s size – will shrink, but we’re not there yet. I firmly believe that, as the technology evolves, HUDs will become increasingly common for motorcyclists. For now, we have NUVIZ as the first company to hit the market with a motorcycle HUD. And it’s pretty dang cool! In a few years, we’ll look back on this moment as the dawn of a new technological era in motorcycling. I’m in. Are you?